The 2017 Toyota Prius v is built for the family that’s doing big things. With its cutting-edge style, available LED taillights and unmatched versatility, this hybrid helps you get the most out of every trip. Its 34.3 cu. ft. of cargo space and 60/40 split, sliding and reclining fold-down rear seats let you bring more of your favorite stuff along for the ride. Advanced tech like the Entune™ Audio system keeps you connected to the music and entertainment you love most. And it all comes in a package with an EPA-estimated 41 mpg combined. There’s a lot more fun to be had. Let’s start exploring. Refreshingly, the term “fill ‘er up” can now refer to cargo. Pop open the rear hatch-style door and you’ll unveil a full 34.3 cu. ft. of cargo space1 – so you can carry the essentials you need for a fun-filled journey. The rear seats in the Prius v offer an array of seating and cargo configurations. The plush upholstery and extensive rear-seat leg room will make passengers in back feel like top priority. The seats not only slide forward and backward, but also recline for optimal comfort. 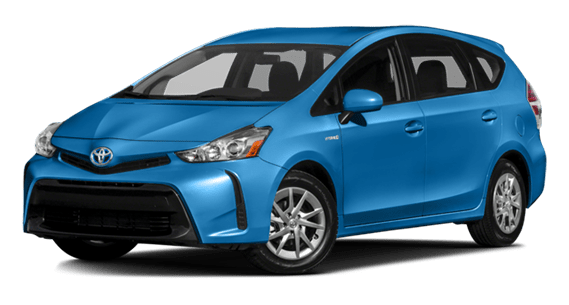 In addition to its cavernous cargo area, Prius v offers a wealth of smaller storage compartments for items like gloves, a flashlight or even a first aid kit. Prius v offers you two windows to the world above with its available Panoramic View Moonroof. It features power shades that operate simultaneously and give every occupant an uplifting perspective. Prius v‘s available SofTex®-trimmed seat material weighs approximately half as much as genuine leather and its manufacturing process generates approximately 85% fewer CO2 emissions and 99% fewer VOCs than conventional synthetic leather. It’s just one more way you can feel good about feeling comfortable. Prius v’s available 8-way adjustable driver’s seat with power lumbar support helps you find the driving position that’s perfect for you. And because customized comfort is the best way to fully enjoy the driving experience, these are not seats you’ll want to get out of anytime soon. With rear seats that recline and slide forward and backward for maximum leg room, comfort is a given. And thanks to plush upholstery and generous rear-seat leg room, back-seat passengers will feel like they’re traveling in first-class comfort. Prius v offers added comfort for those chilly nights. With the press of a button, you can add warmth to any trip with available SofTex®-trimmed heated front seats. With its available Entune™ Premium JBL® Audio with Integrated Navigation 1 and App Suite, 2 Prius v has the tech to help make your life easier and more fun. Featuring a 6.1-in. touch-screen display, integrated navigation system, Siri® Eyes Free, 3 JBL® Premium Audio and a suite of popular apps, it’s one smart way to help you stay connected. Available Entune® App Suite2 brings a variety of popular mobile apps directly to your Prius v. OpenTable® is ready to help you make a dinner reservation, and Pandora® 4 keeps your playlist loaded with the music you love. And that’s just the start: With Facebook Places, Yelp®, iHeartRadio, Destination Search and more apps, you’ll never miss out. The available integrated navigation system1 in Prius v uses the high-resolution 6.1-in. touch-screen display to give you turn-by-turn directions, HD Radio™ 5 predictive traffic, and even a Doppler weather overlay. In Prius v, backing up is easier thanks to its standard integrated backup camera.6 Shift into Reverse and the 6.1-in. display automatically shows what the camera sees at the rear of the vehicle, helping you avoid objects that might otherwise be out of view. Prius v‘s available Single LED (light-emitting diode) projector low- and high-beam headlights with auto on/off and an LED accent light produce a clean white light, offer extremely long life and require 20 to 30 percent less energy than traditional headlights. 3 Always drive safely, obey traffic laws and focus on the road while driving. Siri® is available on select iPhone®/iPad® models and requires Internet access. Siri® is not available in all languages or all areas and features vary by area. Some Siri® functionality and commands are not accessible in the vehicle. Data charges may apply. See apple.com and phone carrier for details. Siri® is a registered trademark of Apple Inc.
5 HD Radio™ Technology manufactured under license from iBiquity Digital Corporation U.S. and Foreign Patents. HD Radio™ and the HD, HD Radio, and “Arc” logos are proprietary trademarks of iBiquity Digital Corp.
Stop for snacks, not gas. With its EPA-estimated 41 mpg combined, 1 the 2017 Prius v helps make those frequent fill-ups a thing of the past. For over 15 years, Toyota has been a world leader in the development of eco-sensitive technology with our advanced Hybrid Synergy Drive® system. This tried-and-tested system continues to be efficient, reliable and more popular with each passing year. Which means you can drive it with more confidence. Prius v is rated as a Super Ultra Low Emission Vehicle (SULEV), 2 a designation indicating it produces considerably fewer smog-forming emissions than an average gasoline-powered vehicle. Prius v offers different modes for different types of driving. ECO Mode helps maximize fuel economy. EV Mode 3 runs solely on battery power for up to one-half mile under certain conditions. And POWER Mode increases gas pedal response for enhanced acceleration. 1 2017 EPA-estimated 43 city/39 highway/41 combined mpg for Prius v. Actual mileage will vary. 3 CAUTION! When driving a hybrid vehicle, pay special attention to the area around the vehicle. Because there is little vehicle noise in EV Mode, pedestrians, people riding bicycles or other people and vehicles in the area may not be aware of the vehicle starting off or approaching them, so take extra care while driving. EV Mode works under certain conditions at low speeds for up to one-half mile. See Owner’s Manual for details.